← Oh No! Not Again! Don’t take life too seriously! Humor is an essential part of keeping yourself in check and preventing your ego from getting away from you. 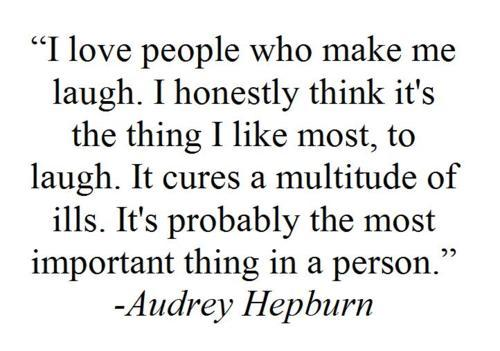 Being able to laugh with others and at yourself can spread joy and make even the grumpiest person smile. Laughter can be contagious even if you didn’t hear the joke. When I was 10 years old my classroom teacher had made the decision to test the laughing theory only we (his students) had no idea of his plan. We walked in after lunch period and he was roaring hysterically, slapping his hand on the desks and acting like he couldn’t possibly contain it. None of us had a clue why but he kept it up and soon all of us (the entire class) were also roaring hysterically and then all of a sudden he stopped on a dime and asked us “why are you laughing?”. It took all of us a moment to settle ourselves down from the laughter but of course we had no idea why. One of the kids in the class said that they were laughing at the sounds of his laughter and his actions and everyone in the class had agreed that was also their experience. It’s strange to me that even though that experience doesn’t sound so significant, it actually was. I think it was the fact that even though we all had no idea what the joke was we felt compelled to laugh and share in the joy, he was teaching us and we didn’t know it. I think we all need and want joy and happiness in our lives and it’s important to maintain some form of silliness in at least one area of your life no matter what age you are because that’s what keeps us young in spirit. 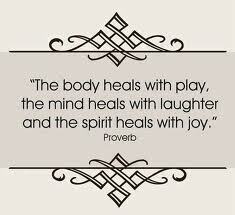 Life can be so overwhelming, challenging and demanding at times and those times can take a toll on the health of your spirit but I believe that laughter can alleviate those wounds or scars, even if it’s only momentarily, sometimes that can be enough. One night I caught a blurb on the local news about a new class that people were taking up, similar to a yoga class, but they would gather to laugh together, joyous, crazy, out there laughing. The people they interviewed said they felt it helped to alleviate their stress and kept them young. I agree and I think that it’s an outlet, similar to exercising, competitive sports or a spa day. All of these things can alleviate the daily stresses that life builds up and I think that laughter is a very valuable tool and asset that we have at our disposal and probably the easiest on our system to access. I’ve played a number of different sports all my life and the injuries that can occur are more likely with sports then just plain laughter. I don’t think I’ve ever heard of anyone actually “pulling their abdominals” because they were laughing too hard. In addition to the joy of sharing in laughter with others, it is also very beneficial to have a healthy ability to laugh at your own foibles. When you are able to do that it helps to alleviate the pressure and reduce the expectations you may put on yourself. There’s nothing worse than holding yourself to measure up to your own standards, chances are they are higher than any standard you hold for anyone else, at least mine have always been. Being able to laugh at myself has helped me to let go of my mistakes so I can learn that they are just mistakes and not failures. I used to view an expectation that didn’t go the way I had wanted as a result in failure and that’s not necessarily the best way to view it. My humor, which is a form of the word humility has allowed me to put things in the perspective they should be in and to laugh when things are just plain funny. The first line of one of my favorite quotes by Ralph Waldo Emerson is “To laugh often and much” and that’s something we should all do to maintain a healthy balance. Thank-you so much Diantha! I always appreciate your positive feedback.